Today’s showcase will be about Trifexis. This little known tablet is the preferred monthly preventative of veterinarians. Puppies coming in for their first checkup will usually be prescribed Trifexis as their very first chewable flea killer. However, there is much more to this vet favorite than just the wholesale slaughter of everyone’s least favorite bloodsucking insect. Dogs taking Trifexis will have three things less to worry about than the average untreated pup. This powerful monthly treatment stays true to its name and fights off three different kinds of unwanted houseguests. That’s right, the holy trinity of dog terrorism: fleas, heartworms, and the intestinal worms whose names you’ve come to know and loathe. Fully matured hookworms, roundworms, and whipworms all tremble in fear at the sound of this drug’s name. These dangerous parasites haven’t got a prayer against the combined might of two powerful active ingredients in the makeup of Trifexis. If you’re old enough, you may have heard of spinosad, a powerful insect killer developed in the late nineties to protect agriculture without any adverse environmental effects. Now it’s doing the job inside your dog’s biochemistry with equal cautious care. The other active ingredient, milbemycin oxime, is a drug produced exclusively for veterinary purposes. It’s the active ingredient inside of Interceptor, another pet preventative favored by proud puppy parents the world over. The drug is metabolized in the liver and acts mainly against the intestinal and heartworms, leaving the insecticidal work to the Spinosad. Together these two make a powerful super drug with a broad spectrum of efficacy. However, that scientific mumbo jumbo isn’t really all that important to the drug purchasing laymen. The average pet owner only cares about one thing. Does it work? Sure enough, this drug garners praise and subscriptions from various veterinary facilities for good reason. The studies (page 3) conducted before the drug was approved by the American Food and Drug Administration showed a 100% effectiveness rating, when properly administered in the suggested intervals. Doesn’t get much clearer than that, does it? A 100% effective treatment in stark black ink on white paper says that there isn’t much more you could do for your dog than keep him or her safe with this powerful monthly medication. Your dog will appreciate the fact that it isn’t itching, but it’s more likely to show gratitude for the tablet itself. The tasty flavoring on the outer shell can pretty much assure a popular reception among the canine population. Convenient – easy to administer and happily received with a wagging tail. Effective—100% effective in the treatment of hookworm, roundworm, whipworm, heartworm, and fleas. Fast acting, and consistent—Begins killing parasites within 24 hours and keeps killing them for 30 days! Tasty—The Flavored spinosad will kill fleas while maintaining a flavor your dog will flip for. And virtually without side effects. So don’t wait one more second. 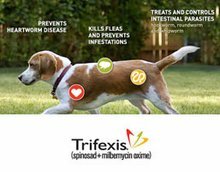 If your dog needs treatment, grab yourself some Trifexis today!